Like a lot of other vendors featured on the blog, I discovered Brewed 2 Burn® candles while scrolling my Instagram feed. The gorgeous labels and names like "Amber Ale" and "Vanilla Coffee Porter" immediately grabbed my attention. Being a wedding planner, as soon as I saw a candle with the label, "Will You Be My Groomsman," I knew I had to learn more! There are so many unique ways that we ladies use to ask one another to be a bridesmaid, but I never saw anything quite so perfect for the guys! When I headed to the website and learned more about Michelle, the owner, and how her family has been in the beer business for four generations, I knew I had to reach out to Michelle personally. Back in my college days, I drank what was cheap and never imagined myself becoming a "beer snob." However, after being with my significant other for years and taste testing all of the craft beers he drank, I have to admit that it's hard to drink anything else now. I love the work and passion that goes into brewing craft beer and the stories behind the breweries. It's quality and it's a commitment to a craft. I think the same can be said about Michelle's candles. Each one is hand-poured, the jars and labels are gorgeous and the scents are incredible. I received the new seasonal scent, Winter Pine Pale Ale, in the mail and the amazing smell hit me as soon as I opened the box. I'm pretty sure it's going to be my favorite scent of the winter season! You can even build your own six pack on the website! How cool is that? What a perfect, unique gift for the craft beer lover in your life! Finally, Michelle has a heart for giving back and a portion of EVERY candle sale goes to the Juvenile Diabetes Research Fund. Read on to learn more about Michelle, Brewed 2 Burn® and what it's like to run a small business in the 'Burgh. 1. Tell our readers a bit about Brewed 2 Burn® and how the company got it's start. With the support and love of her parents, husband, step-children and close-knit family and friends, Michelle Dangelo Arnoni launched Brewed2Burn®. And while her passion for candles is one that she has cultivated on her own, Michelle’s relationship with the world of beers began at an early age. Growing up in the beer distribution industry, Michelle witnessed first-hand the dedication that her father brings to the business. The honor of working alongside her father each and every day has taught her to treat clients like family. His example continues to influence Michelle’s desire to deliver outstanding client service. Over a decade ago, she joined Brentwood Distributing and today serves as the Vice President of Sales. Now in its 61st year and three generations strong, Brentwood Distributing continues to service establishments throughout the Western Pennsylvania region. Michelle deeply values the relationships and expectation of client satisfaction that she and her family have carefully cultivated with their partners at local breweries, wholesalers, bars and restaurants. She and her team at Brewed2Burn® bring that same devotion to their work, and hope to spark joy through the flames lit by their hand-crafted creations. 2. Tell us what is involved in the process of hand-pouring a candle. We are committed to being a bespoke candle company. The process starts with us purchasing beer bottles, as if we are a brewery. We then send those beer bottles to be cut by a PA glass cutter. Our mission was to support as many Pennsylvania companies as we could. Being a hand poured candle company, means that every candle is poured by one person. We use a large vat and then pour individual pouring pitchers which only hold 4 pounds of wax at a time. It is a very tedious process, but worth it. The quality that comes from our candles is far superior than a non- hand poured candle. We even hand adhere each wick and each label by hand. 3. What scents are available and do you have a favorite? We offer six signature scents and Seasonal scents. Our Six Signature Scents include Gingered Apple Cider, Amber Ale, Nutbrown Ale, Cherry Wheat, Vanilla Coffee Porter and Oatmeal Stout. We also have seasonal offerings available every quarter (just like the craft beer industry). Our current seasonal offerings are Spiced Pumpkin Porter, Winter Pine Pale Ale, and Winterberry Wheat. As in terms of a favorite? That’s like picking you favorite child ...you just can't do it! My heart is invested In every scent and every candle we pour. However, if I had to pick a few favorites, they would be Amber Ale and Winter Pine Pale Ale. 4. What makes your candles unique among the competition? In terms of candles, there are plenty of other candle companies, but in terms of Craft Beer Candles...not so much. We truly have a unique and quality product. From the quality of wax we use to our artwork. Another unique factor to Brewed 2 Burn® is that we also wanted to be customizable. 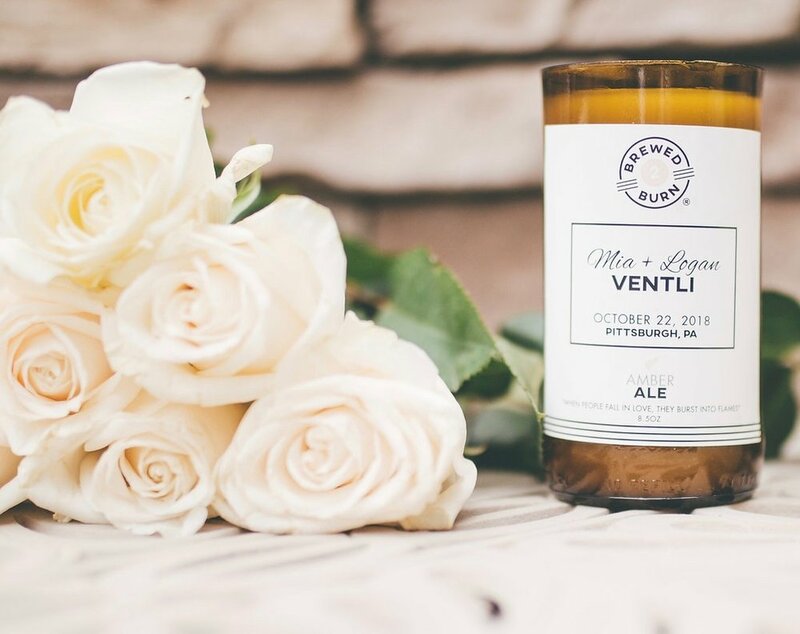 So, we created the wedding collection, which no other craft beer candle company is doing! However, The biggest thing that makes us stand apart is that we give a portion of EVERY candle sale to the Juvenile Diabetes Research Fund. Its printed on every one of our back labels. This is a cause near and dear to my family's hearts so it was important to me to create a product that gives back. 5. Where do you draw inspiration for new scents? My background is the beer business, so I am surrounded by the ever-growing craft beer market. I took popular styles of beer and translated them into candles scents. For instance, pumpkin beer season is huge, so our fall seasonal came naturally...Spiced Pumpkin Porter. 6. Since Olive & Rose is a wedding planning company, we are curious as to how Brewed 2 Burn® candles can be incorporated into someone's wedding. Last year, I was blessed to get married. In the planning process, I knew I wanted to Brewed 2 Burn® to have special wedding candles. So, we created a product line that encompasses the beginning stages of every couples planning process to their big day. Being a bride myself, in 2017, I noticed that there were tons of options for asking your special ladies to be a bridesmaid but few for the guys. So, our first focus in the wedding collection was geared towards the men, when we came up with customizable "will you be my groomsman candles". We are able to customize names, dates and locations and colors. Our next step was to incorporate the girls. More and more woman love craft beer so we wanted to give them a voice too. The third and most universal option is the customizable wedding favor and or wedding gift. If you wish to adorn each of your guests’ tables with candles to be taken home as wedding favors, Brewed2Burn® candles are an ideal wedding keepsake. Brides and grooms can choose from among our six classic scents, as well as our traditional beer bottle or our new elegant crystal clear jars. We’ll create a label featuring the wedding colors, couple’s names, wedding date and location of wedding. Plus, each candle will feature a delightful quote by the author Jandy Nelson: “When people fall in love, they burst into flames.” We recently wanted to extend our customizable offerings not just to our signature beer bottles but now to clear glass jars. That way if you are not a beer drinker we have a customizable candle for every person! 7. It's obvious that people have fallen in love with craft beers. What do you think draws people in and keeps them coming back for more? It is the idea of not being mass produced and also I think because of supply and demand. To be a craft brewery, you can only produce so much beer. So that being said, people always want what's limited. Just like our candles, craft breweries have a bespoke element to their process. Giving a quality and special feel to their beers. 8. We personally think Pittsburgh is an amazing place to be a small business owner right now. Why do you think it's important to support other local businesses? Supporting and shopping local is very important. Small business and local business is what this country was founded on, and I believe it is important to believe in and support your local community. Pittsburgh is such a unique place. I truly feel we have always had that sense of pride and we have always stood behind our companies, and the people that made them. It the best city on Earth! 9. Any business goals for 2018 or new projects on the horizon that you can share with us? We have three major goals for 2018. First, We hope to go to our fist national trade show so we can expand our company. This would create more jobs at Brewed 2 Burn®, and also knowing the more candles we sell, the more we give back to JDRF is a very exciting thing! Second, we hope to expand our new City Candle collection. We started with Pittsburgh (because –obviously we love this city !!). We came up with a Pittsburgh Porter Candle complete with our beautiful sky line on our front label. We hope to expand our city candle collection, and create other city labels where our candles are gaining popularity. We also have a new line coming in late November...it's still a bit of a secret, but let's just say it will be our "fancy" line of candles. 10. We love to ask every small business owner: If someone is thinking of starting a small business of their own, what advice would you offer them? My biggest piece of advice is don't let anyone tell you that you can't do it! It will consume your life and all your time and energy, but getting an opportunity to do something you believe in and love is worth every tear, every long night and every ounce of strength you have. Dream Big!